Robyns Simple Life: Word Verification.. Please Please Go Away! Word Verification.. Please Please Go Away! I have to be honest when I tell you that for myself and a lot of other bloggers and blog readers I know we have gotten to the point that we either no longer comment and or completely delete and stop visiting blogs that have this before you can post a comment.. The reason why? Some of them are impossible to figure out, sometimes it can take four to five tries before you get it right and by that time, it's not worth the time.. Also, some of us, ech hem, are in the age bracket where our eyes are not what they used to be? and seeing these squiggly numbers and words is not only annoying it hurts the eyes.. 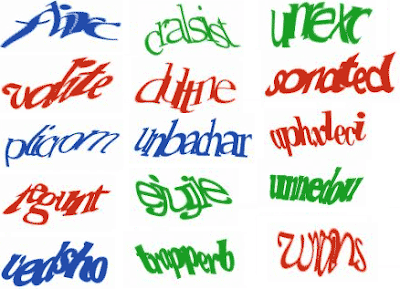 I know this can be a controversial issue's with some bloggers because they are afraid of spammers commenting on their blogs but the best tip I can give anyone with a blog is, get rid of the Captcha! and just keep a close eye on the comments in the com box.. Dedicated blog readers and commenters ( is that a word?) will thank you!.. What I don't like about them, is if you ask for it to be spoken, the voice is all garbled. Can't win for losing. I just keep hitting for a change until I can understand the writing! I love reading your blog, it inspires me and also lets me know I am not alone in this journey of life! Amen sista. I cant read my own handwriting. How am I expected to decipher those squished together squiggles? I totally agree! Sometimes I have to hit the refresh button to get new words & numbers several times. It definitely needs to go away! Hi Robyn. I scrolled back to see your flock. Beautiful'!!! I love my chickens!!!! Looks like you are busy, just like the rest of us!!!! What's really fun is carefully typing the captcha and not noticing your iPad autocorrected it...grrr! I haven't used word verification in YEARS and I NEVER get spam. In fact when I check my spam page I sometimes find real comments in there! I'm having a terrible time trying to figure out the letters! I hope everyone gets the message...SOON! I agree! I get irritated when I can't read the letters and have to try and try again. So few bloggers have this compared to when I first started blogging 4 years ago. That's what makes the absurdity of word verification stand out. I hope it is abolished once and for all!